I happened to notice blue speckles on the face of the frog in the last post and thought it might be an aberration of the image capture. But it’s not — it’s due to the chromatophores in the frog’s skin. It’s the answer to why frogs are green, or blue, or red and orange, or how they change color from one shade or pattern to another. The pattern of color in this subadult Gray Tree Frog (also inhabiting the rain barrel along with the adult in yesterday’s post) shows the range of colors in this species — from almost white to dark green. If you zoom in, you see patches of skin that are white, various shades of gray, and a range of shades of green almost to black. On the right side of the photo are patches of skin reflecting blue-green instead of green, which suggests the use of structure to produce color (as discussed earlier in birds). 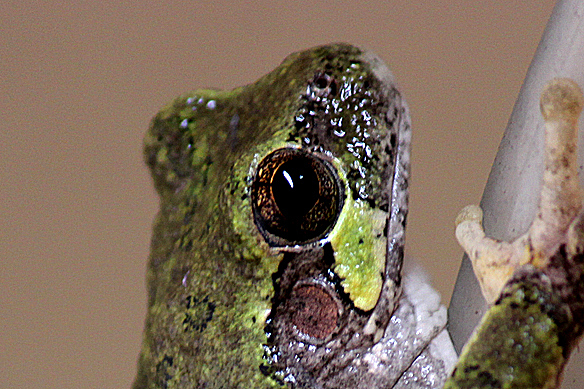 It turns out that frogs have three layers of chromatophores (color-producing cells) in their skin. The deepest layer are melanophores that produce melanin pigment giving skin a brown to black color. The middle layer are iridiphores which contain no pigment but instead have mirror like plates capable of producing iridescence, or when viewed from a certain angle, reflect blue light. The most superficial layer of chromatophores are xanthophores that contain a yellow pigment. 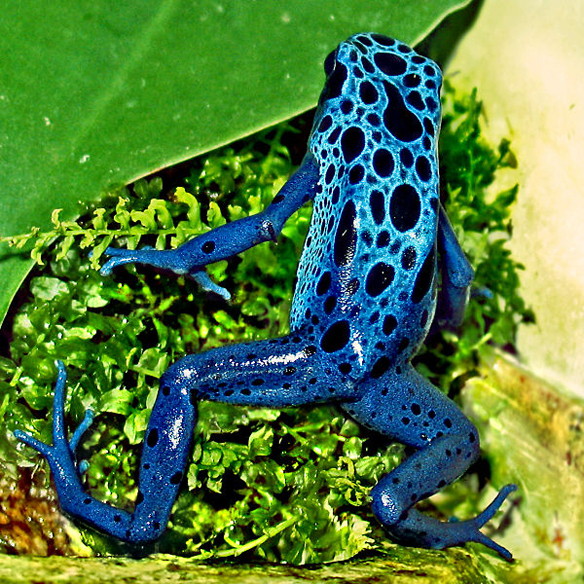 Frogs that lack xanthophores are various shades of blue, like this blue poison dart frog found in Brazil. Black spots are created by the melanophores underlying the iridophores. 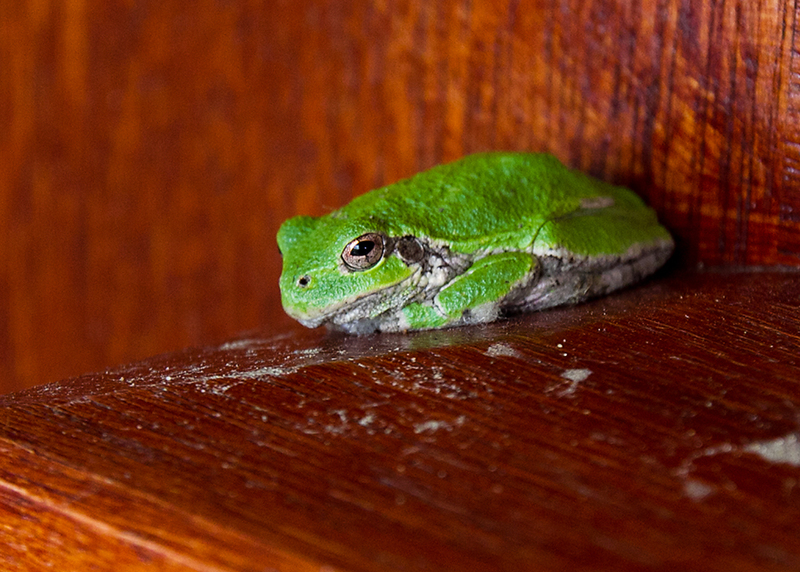 And, more amazing is the fact that Gray Tree Frogs can change color to suit their background (or their mood) within seconds, not as fast as a chameleon, but fast enough. They do this by dispersing (darker color) or contracting (lighter color) the pigment granules within the chromatophores or even changing the entire shape of the cell.